Product Review: Two beautiful Preschool Islamic books.. There are so many Islamic books for kids out there now. Some are good and some are not so good. But these two lovely books are just so beautiful mashaAllah. They are both hardback and so perfect for Z’s age (3-5) to read. The first book, Allah is Al Khaliq by Saba Ghazi Ameen is A book about colour. She links the teaching of colour to Allah’s name Al Khaliq (The Creator). The pages are tabbed and each page is a different colour. It really is just so cute and I love the original drawings in there. The second book, Allah is Ar-Rahman (The Compassionate) explores the theme of shapes. Again, top quality mashaAllah. This is also a lift the flap book. I know I keep saying it but really, these books are top quality and just so cute. Am amazed at how this author has brought in colour and shape and linked it to the names and attributes of Allah. 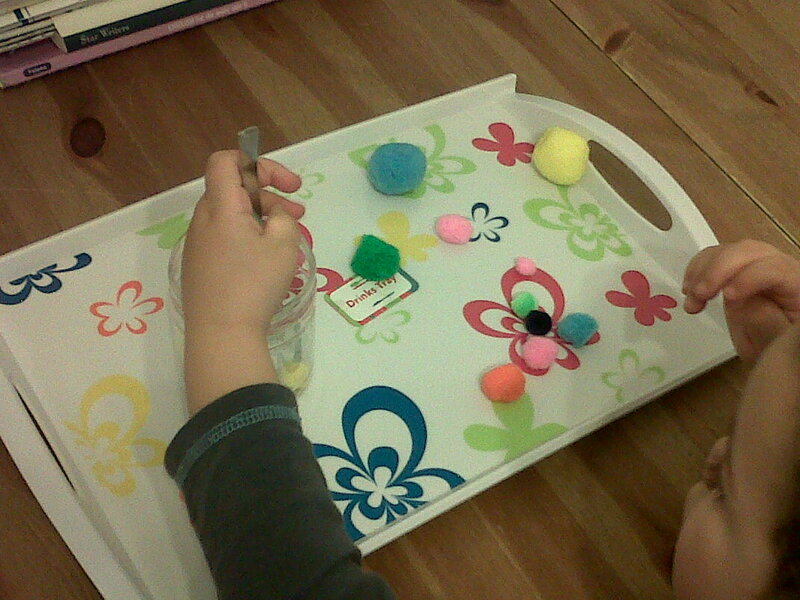 Perfect for little ones and shows that Islamic teaching can really be brought into any subject. Please do visit www.alfarooqinternational.com where these books can be bought and remember that they have a special 25% discount for us home edders! Enjoy! Leave a comment if you end up buying them and what you thought of them. Z will be 3 in about 3 days inshaAllah. I used to do quite a lot of work with R when she was that age but subhanAllah, he is such a different character and learner! I set up Z’s Montessori space a couple of weeks ago and he can only go and use the activities when R is doing her formal work. 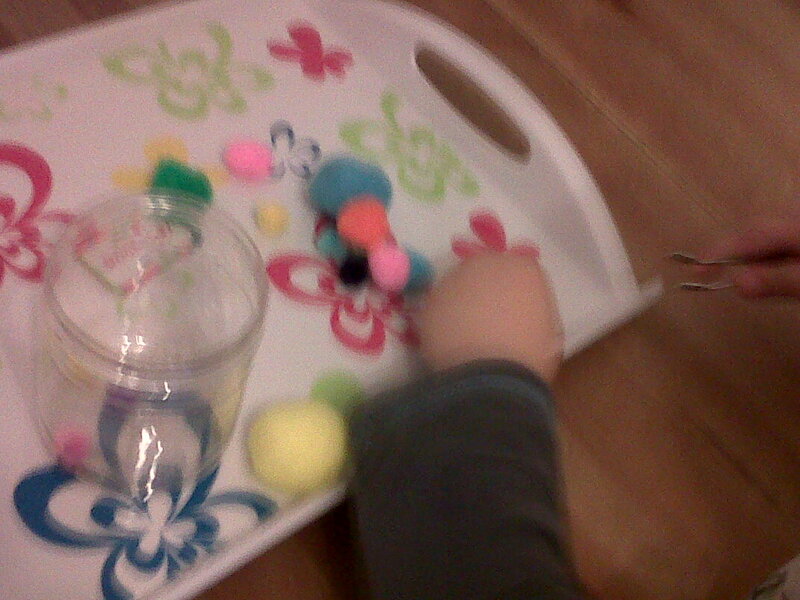 The way it works, is that when R is doing her work, Z can choose any tray of activity he wants from the shelves. 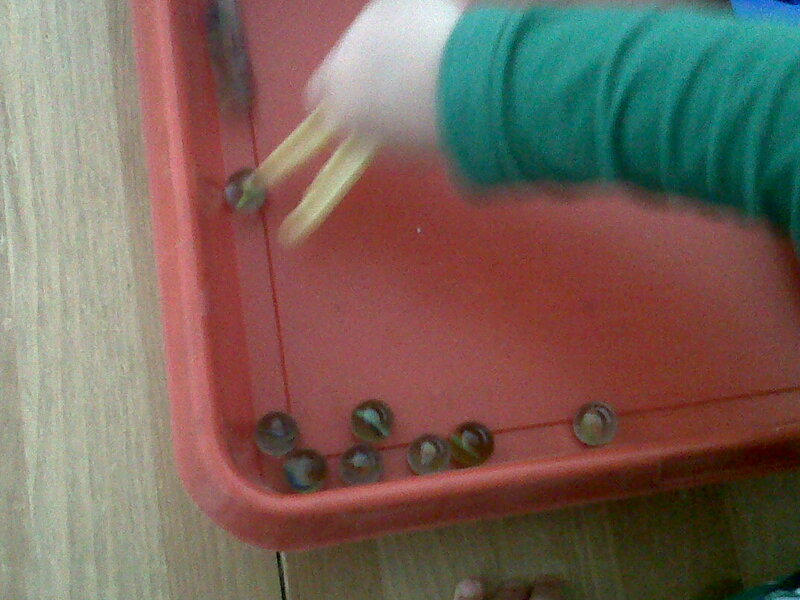 One rule of montessori is that they choose it themselves and then they have to tidy it away and put it back themself before they take the next one. 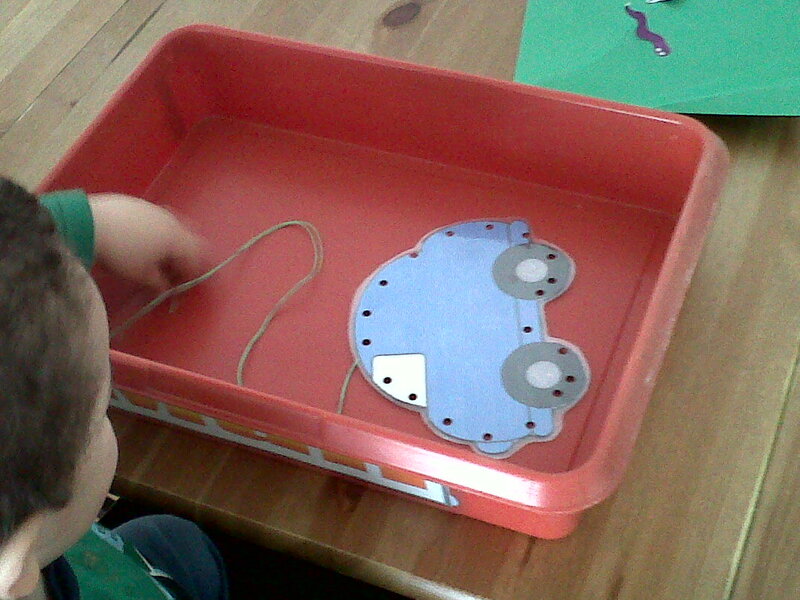 Lacing a car – good fine motor skills. 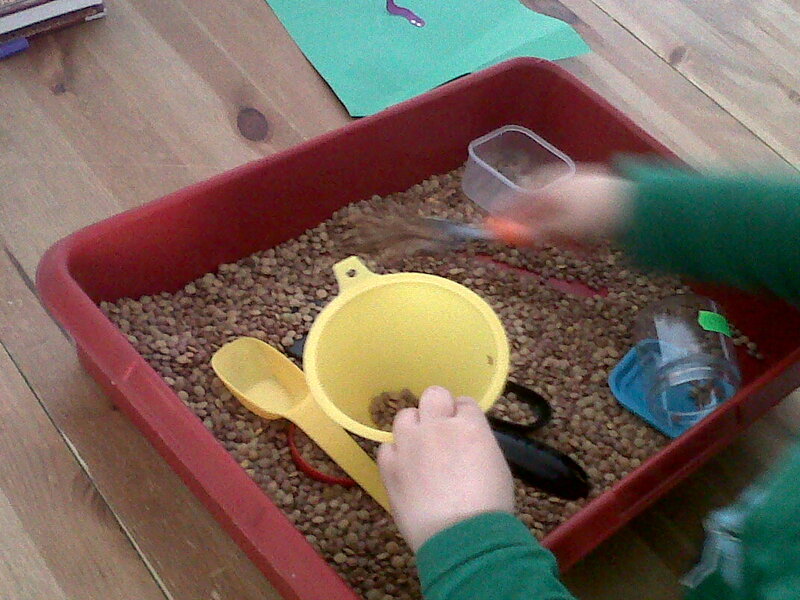 Pouring and scooping with a pack of old lentils. 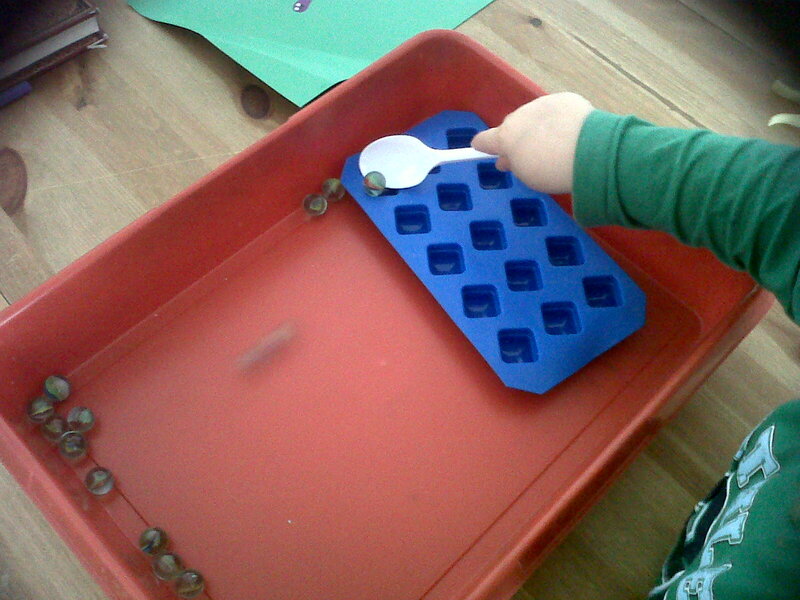 Catching marbles with a clothes peg and placing each one into a square of an ice cube tray. 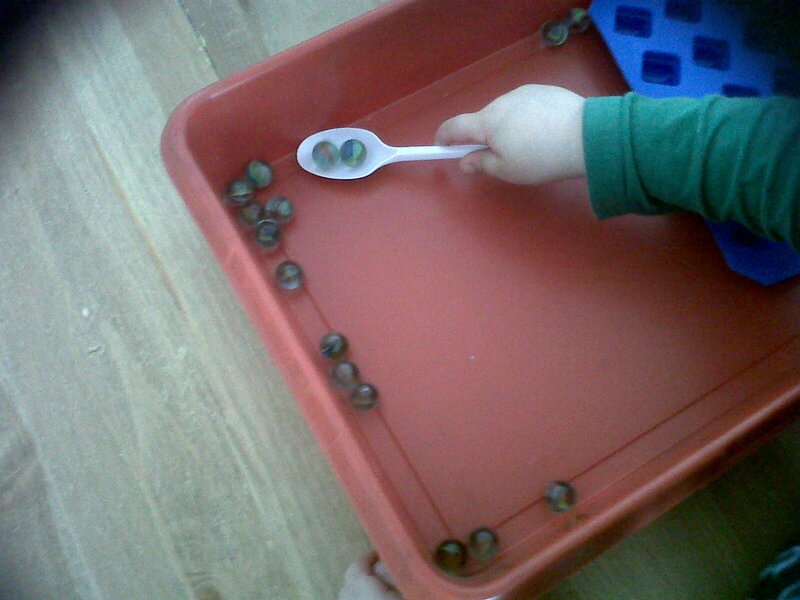 He also had the option to do this using a spoon. 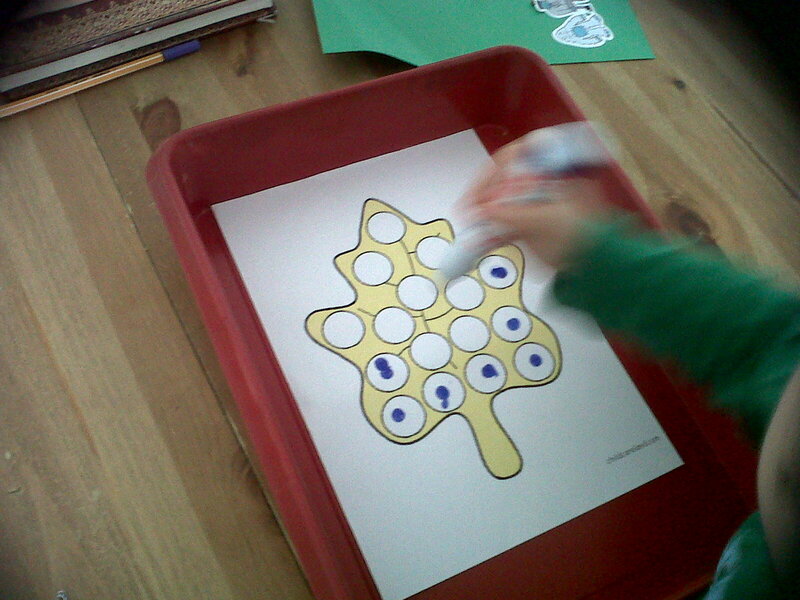 Do a dot on a leaf pattern. Bought bingo markers from 99p shop for this. More of the lentils stuff. 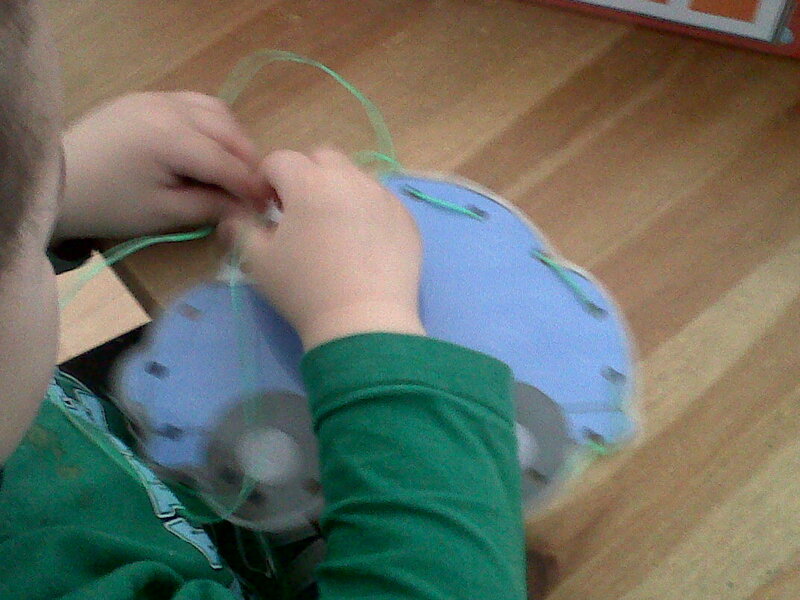 Even R wanted to have a go and spent a good 20 minutes doing this! 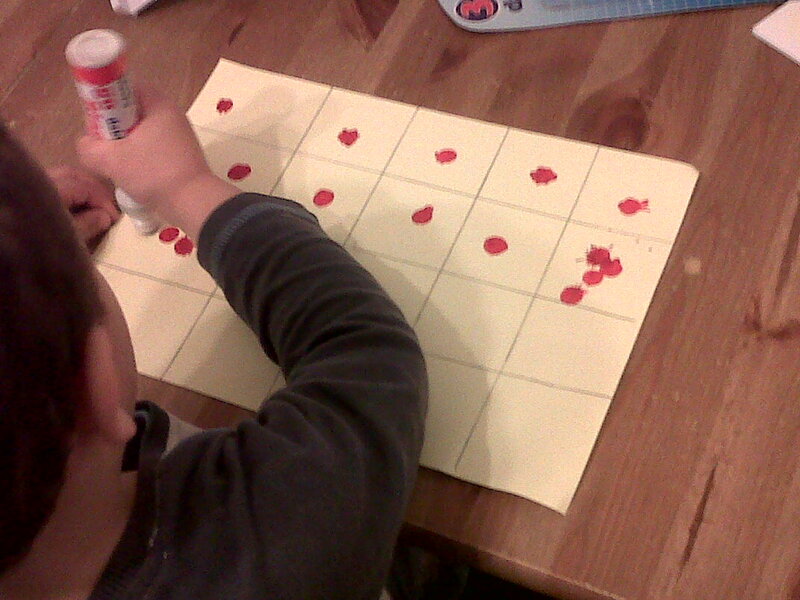 Do a dot in a grid. 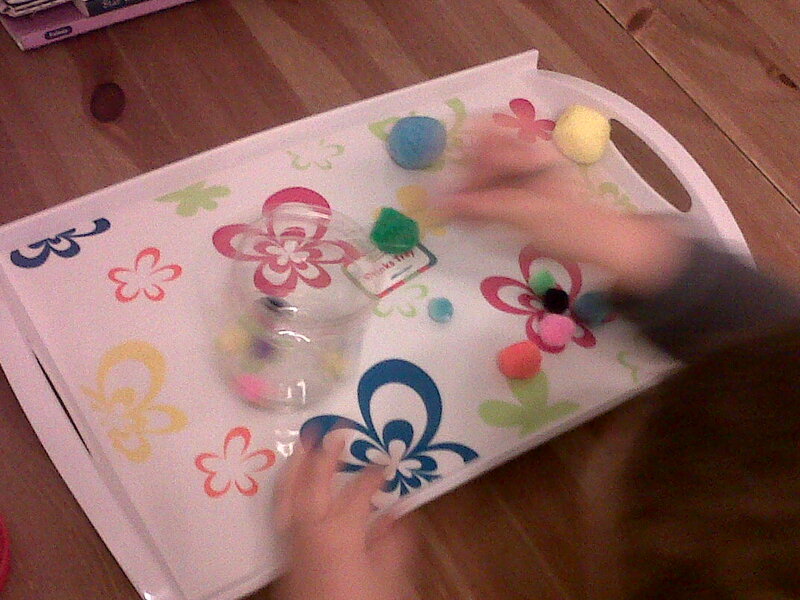 Picking up pom pom balls with tweezers and placing them into a pot. 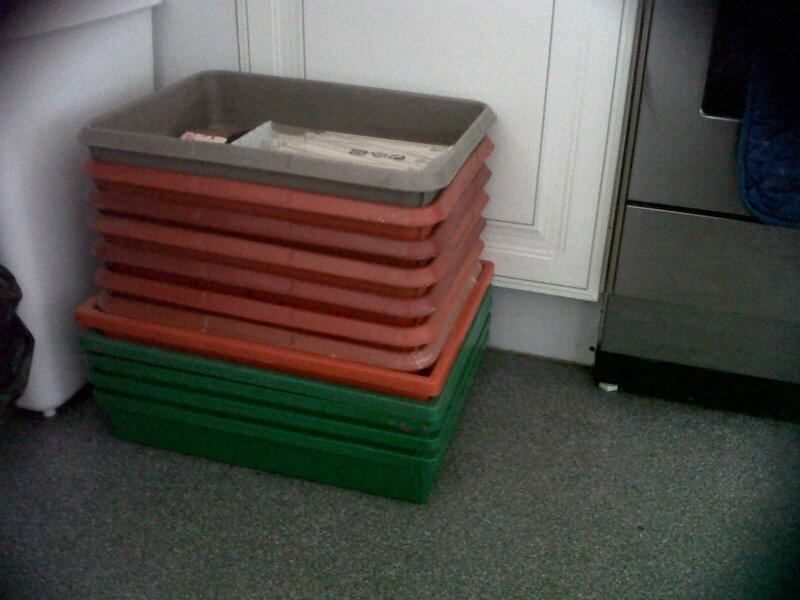 These are the old school trays. Alhamdulillah, a good find. Perfect for montessori inshaAllah. 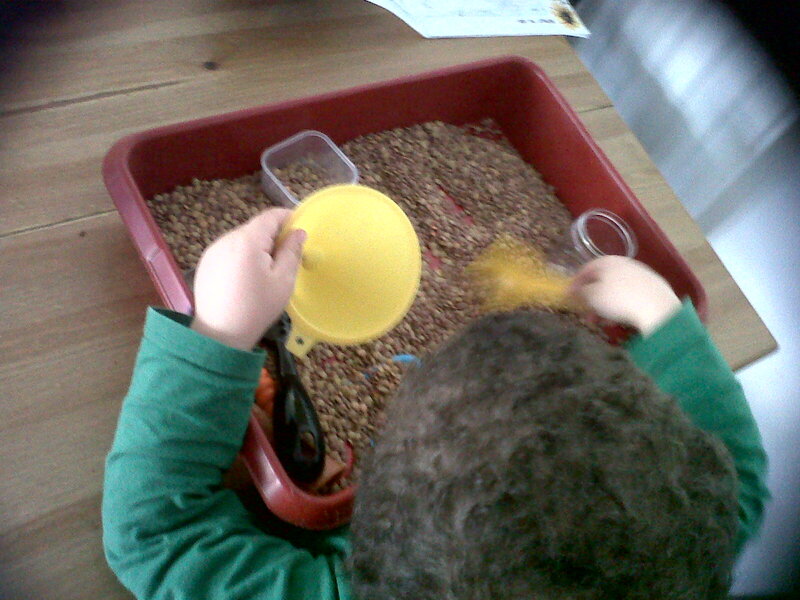 I’ve spent this week preparing to start with Z’s home ed. 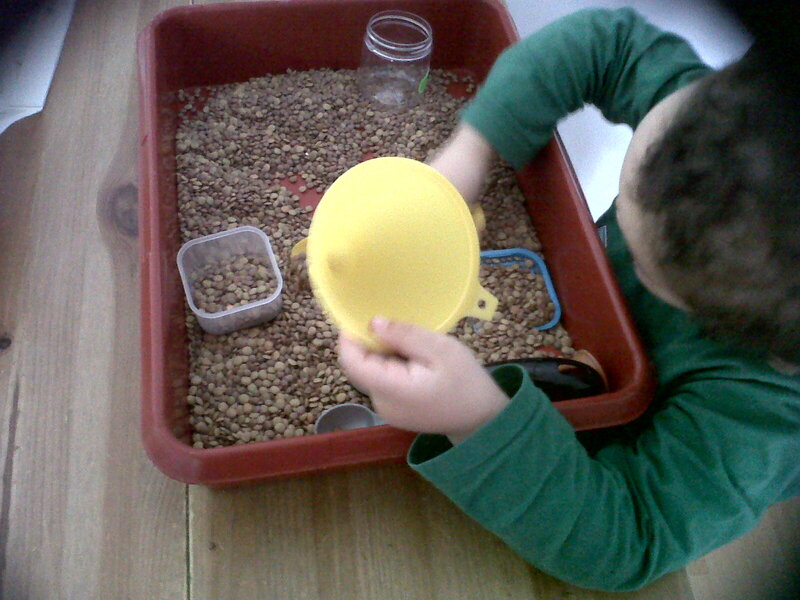 He’ll be three next month inshaAllah and so ‘MONTESSORI LEARNING – HERE WE COME!’ I’ve spent my time searching montessori websites and blogs for ideas. 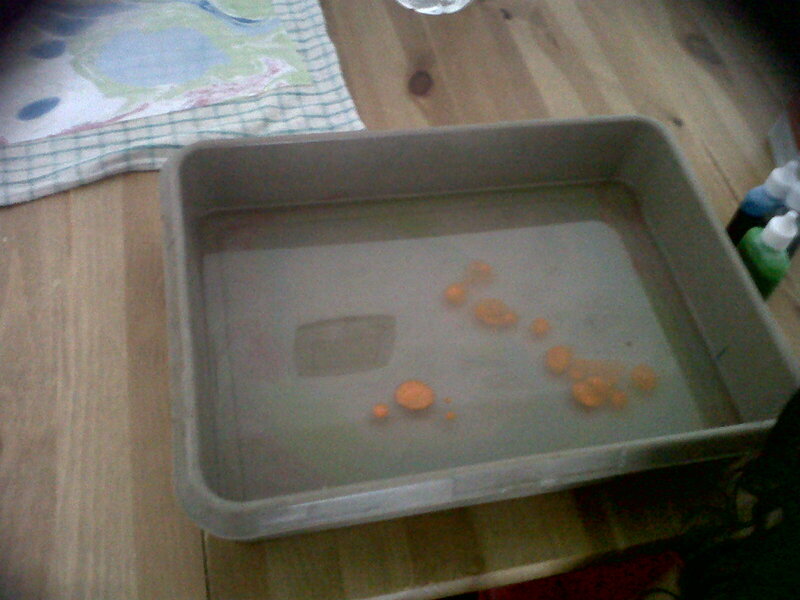 Went down to the pound shop to buy certain items needed for montessori and alhamdulillah have got my trays ready. I’ll be using our famous ‘cupboard’ (for those who have been to my house) as his space and the trays will be placed on the shelving in that cupboard. 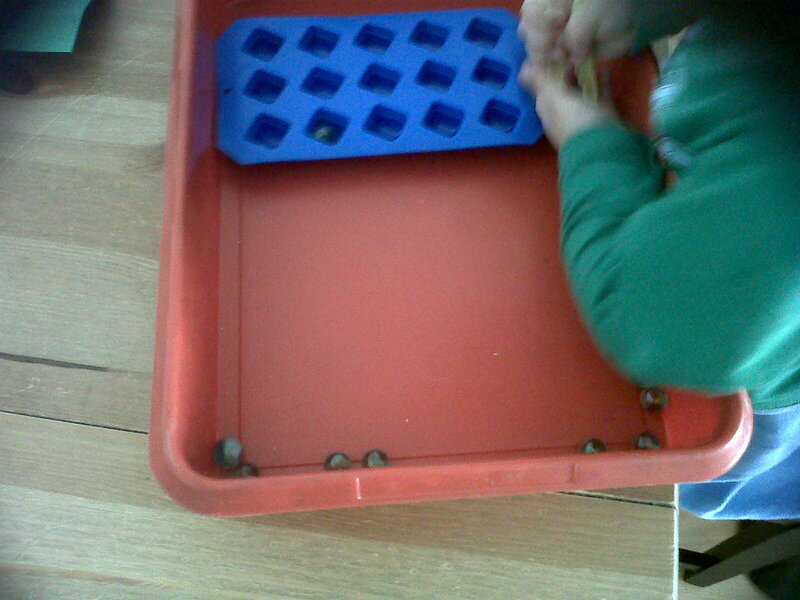 He can choose as many trays that he wishes whilst I home ed R and outside of those times he won’t be allowed to work on his trays. I really think this style of learning is going to suit Z inshaAllah. I’m actually really excited! 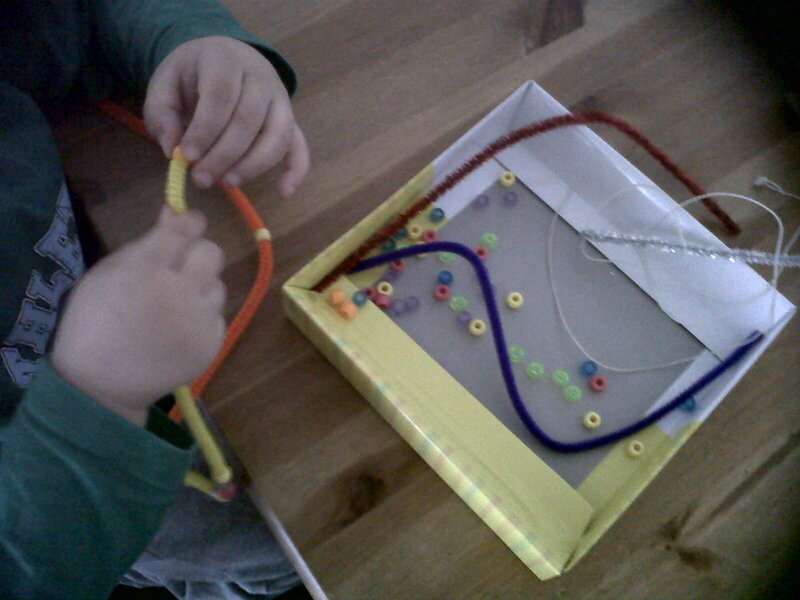 The pipe cleaner and small beads are ideal for little fingers! 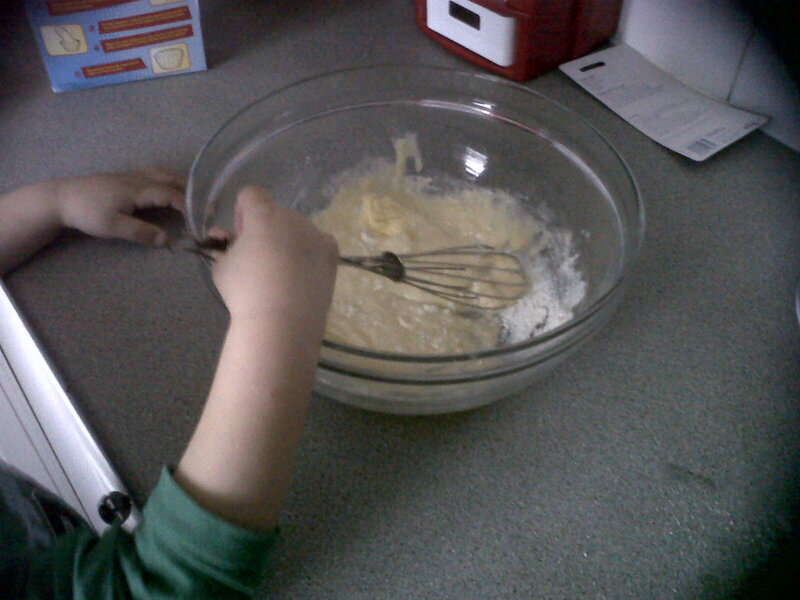 Baking – this time R didn’t join in. It was just me and Z whilst R watched baby Y in the other room. He absolutely loved it! I think I need to schedule in more exclusive baking time for Z and me. Lol! He wasn't as messy as R normall is when she bakes! 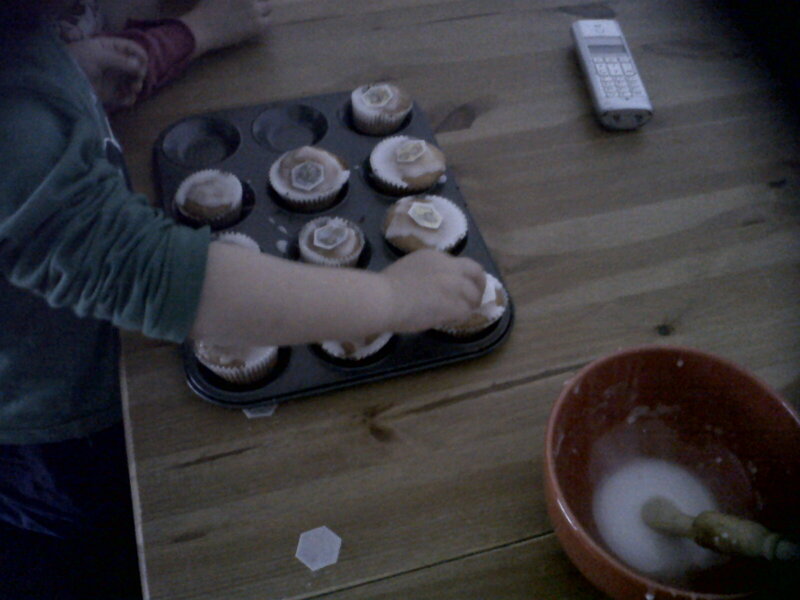 His favourite part - sticking the edible stickers on to the cupcakes! 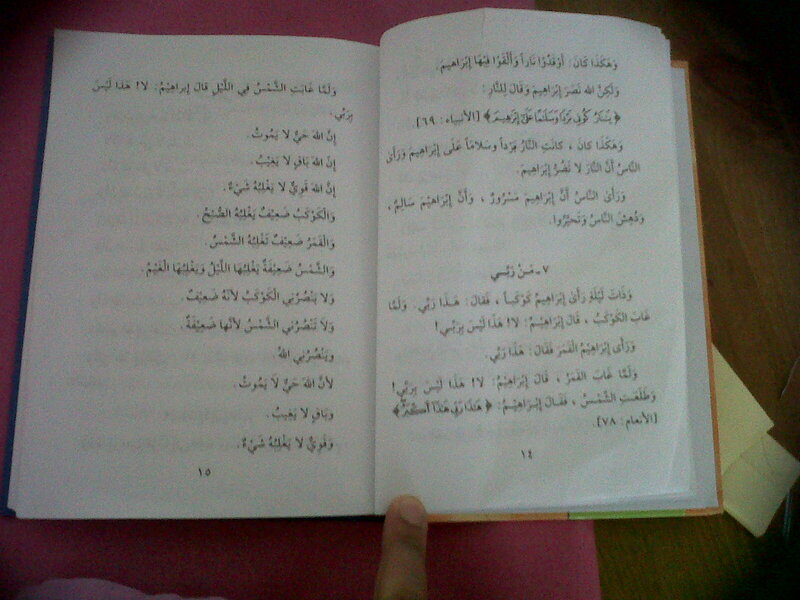 For those who know a bit of arabic, click on the pic to make it larger - just wanna show you how child friendly this book is. R has decided herself that she wants to focus on her Arabic reading and so mashaAllah she decided to read a little of this everyday to herself. It is the stories of the prophets in Arabic and the level in this book is perfect for her right now. It is engaging, repetitive and the level of Arabic is not too difficult. In fact, she was reading aloud whilst I was having a lie down and she was testing me by asking me to translate what she had just read. I was definitely learning. I asked her father to listen to her when he came home and he also tested her and she is understanding what she is reading mashaAllah. This has been my dream, for my kids to be able to read, write and speak Arabic. Although R can speak Arabic mashaAllah, her reading and writing was definitely not up to scratch. But alhamdulillah, it is now picking up. 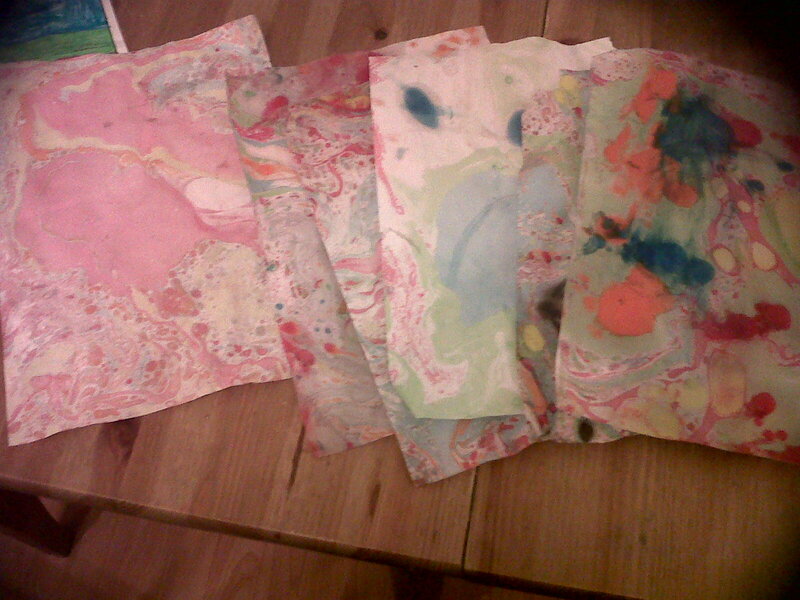 After adding different colours and blowing them around in the water, she laid the paper on the water, and then lifted it up and here you have a variety of marbled pieces of paper! 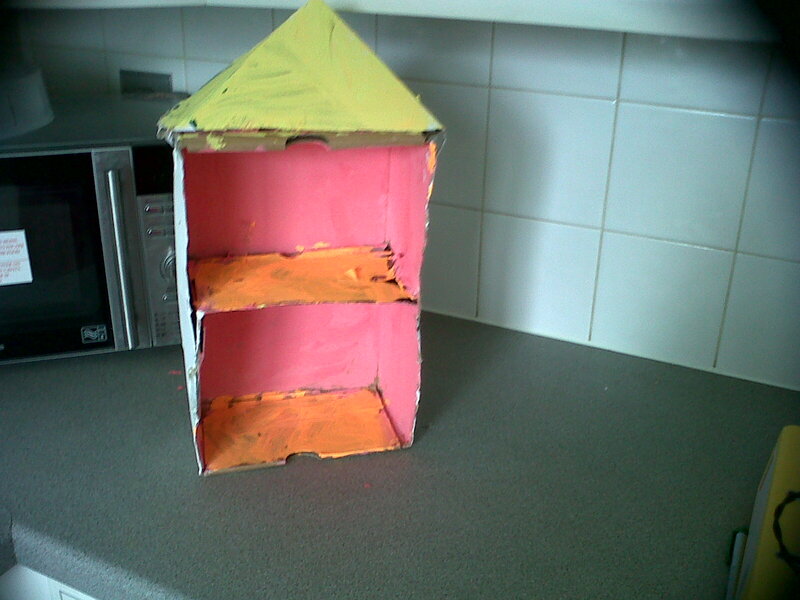 Probably a house from the 70s with the colours she chose for the walls and carpet! At our home ed group a few weeks ago, my dear wonderful sister Oum L brought in some sunflower seeds and pots with a little sign. R planted the seed and she has been looking after it really well. Can’t tell you how excited she was when she saw the shoot! And so she is following her father’s guidelines of watering it every other day and now there is a shoot, every 3 days. (I don’t have a green finger in my body so glad he’s advising her lol). She then said that she wanted to learn about Sunflowers. 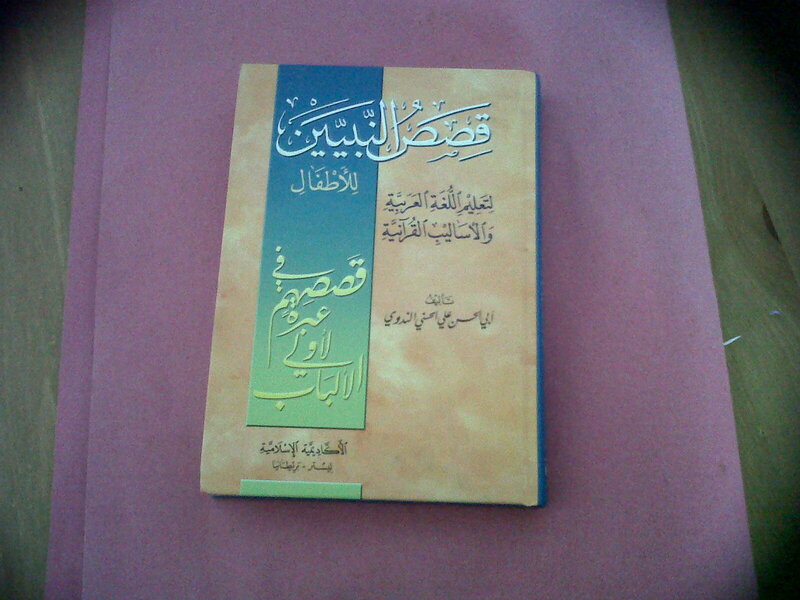 And I remembered a fantastic project I had picked up from somewhere, dug it out and alhamdulillah thats sorted. It was only yesterday that I thought about doing another clear out in terms of our books and educational resources but then subhanaAllah I’m glad I didn’t because something like this sunflower project book has come in handy! I am just so busy right now, that I rarely have time to blog, to even visit the IHSAN forum. The usual Quran, Arabic, Math, English and Islamic Studies has been taking place. R finished off a sewing project which I will blog about separately as it is a very sweet new product that we were asked to review. At the moment, her interest lies in horses. 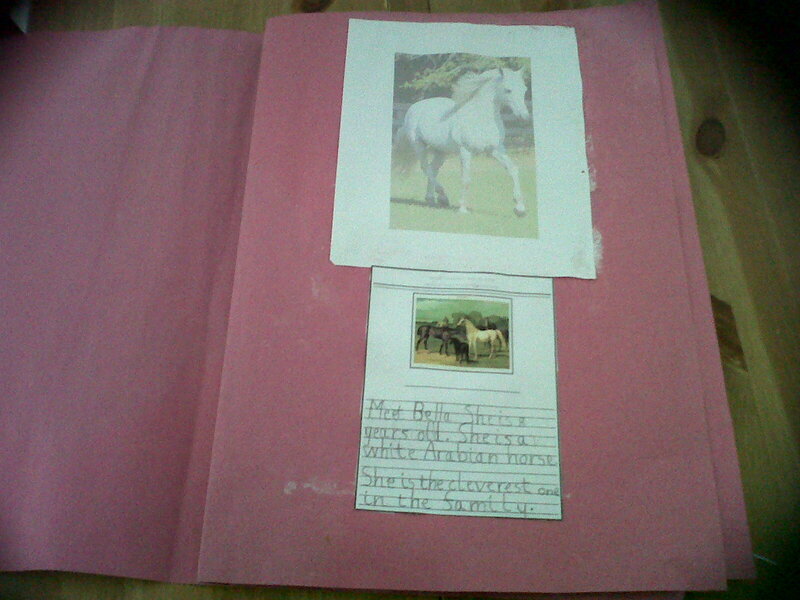 She has started a new horses lapbook. 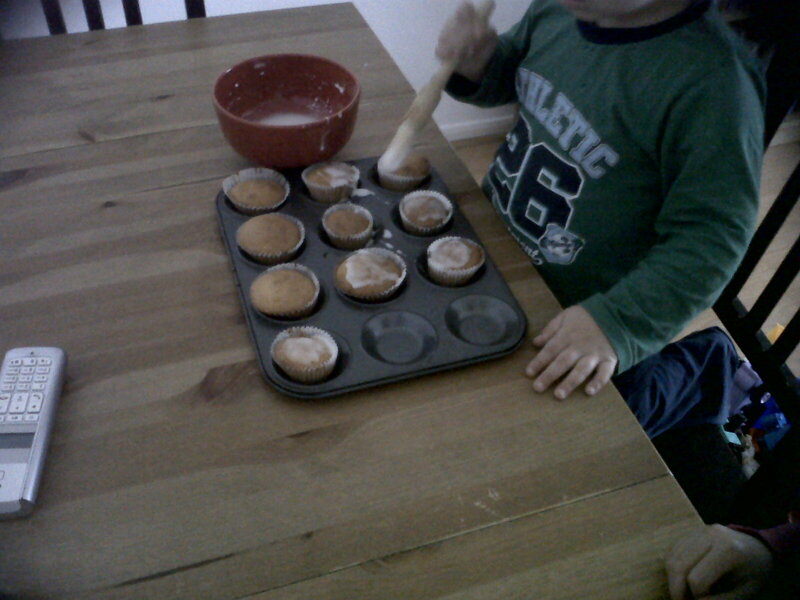 We seem to be baking all the time! Maybe she’ll teach me a thing or two! 😉 And the usual imaginative play. Sometimes she’s a lion looking after her cubs. Other times she’s an explorer. And more than often she’s Mummy and I find Z in a pretty skirt and cardigan with a headband on his head! Oh dear! She is also really into the Deadly 60 program on bbc iplayer cbbc at the moment. Quite interesting stuff. She isn’t really into reading fiction at the moment. 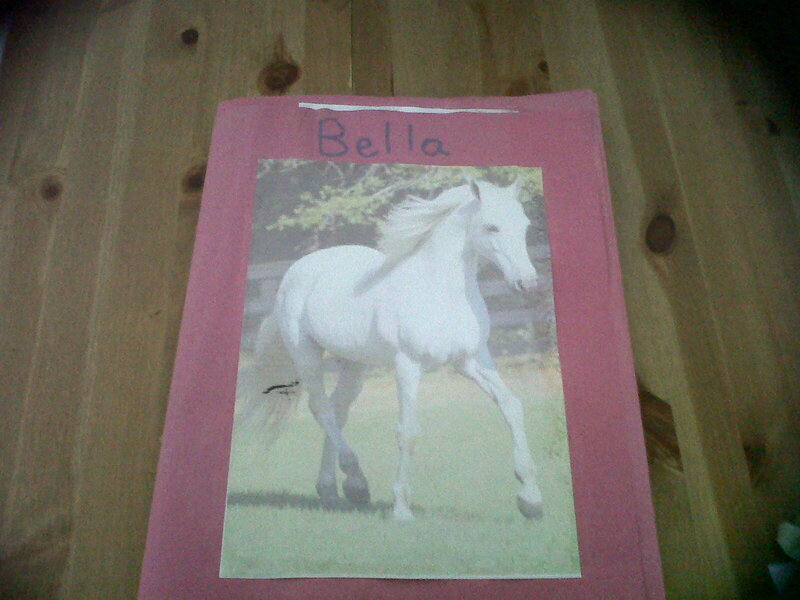 But is reading anything she can find on animals – non-fiction based. We’ve been playing a lot of games: battleship, uno, snakes and ladders, stack ’em. 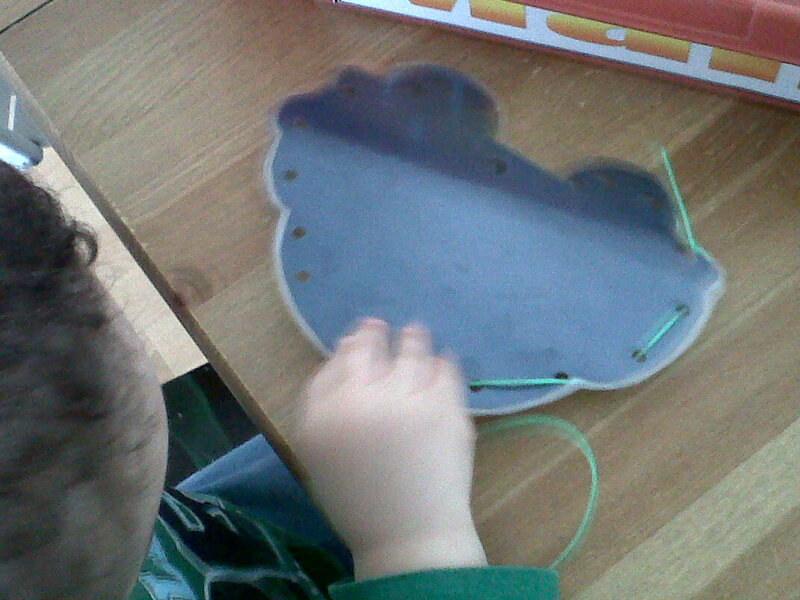 We’ve just started and he cut out a sqaure and decorated it with glitter. We walked around the home trying to find things with square shapes. He is really getting into book and asks me to read things constantly to him. He loves books about dinosaurs, fire engines and trains. I’ve realised in order to keep up with his demands for me to read to him, I literally have to stay put on the sofa for a good amount of time and do nothing else but read to him. As for baby Y, he’s almost 10.5 months old! Oh my gosh, I can’t believe a year has almost gone by. It feels like only yesterday when I was blogging asking everyone to make dua that I would have my VBA2C! Baby Y is EVERYWHERE! Crawling really quickly, standing up or anything he can grab onto. Pulling books of shelves, putting everything into his mouth! And I think he might start walking soon. He pulls himself up on to something and then lets go and takes a lot of joy in knowing that he is able to stand up on his own without leaning on anything. Yup, I know – I’m in trouble! Nothing too exciting to report I’m afraid. Oh, R has asked that we go back to our block timetable of doing things – so we’ll be returning to that next week inshaAllah.